Sciblogs | What do Kiwis die of? What do Kiwis die of? I have never really understood why some people are desperate for immortality. Like those crazy millionaires who have their heads frozen in liquid nitrogen. I am not afraid of dying, but I would like to die painlessly and without much fuss, and preferably with all my faculties intact*. But what am I likely to die of? We looked at figures recorded by the Ministry of Health of the primary causes of death for the 29,204 people who died in New Zealand in 2009. For simplicity, we have only looked at the causes that were responsible for more than 1% of those deaths and have summarised them in the infographic** below. It is important to bear in mind though, that the figures cover what was recorded on the death certificate which may not always be the immediate cause of death. For example, many of those who are recorded as having died of Alzheimer’s disease are more likely to have died of pneumonia or a urinary tract infection. 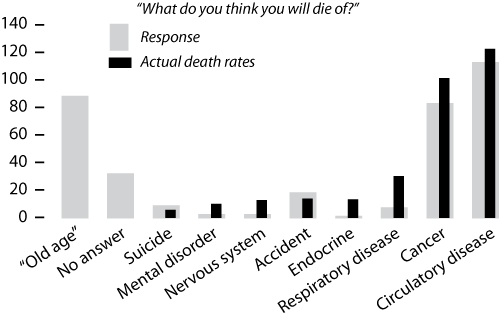 To see if people’s perceptions tallied up with reality, we took to social media and asked people what they thought were the biggest killers and what they were likely to die of***. So what did the Kiwis we surveyed think? Firstly, and unsurprisingly, that many would like to thought they would die of ‘old age’. Sadly this is not recognised as a cause of death by the Ministry of Health! It was also interesting how discomforting many people found the survey, with a number of people telling us that they did not want to think about how they might die, or skipping that question entirely. But many people did take the time to think about it, so how did their perceptions match the Ministry’s statistics? 31% of those surveyed thought they would die of conditions like angina, heart attacks, strokes and high blood pressure, which are classed as ‘circulatory diseases’. And they are probably right, because in 2009 circulatory diseases were New Zealand’s biggest killer, responsible for 35.5% of deaths (10,372 people). 71.8% of our survey participants underestimated the number of cancer deaths in New Zealand, although 22% of them thought that cancer would be the cause of their demise. In fact, cancer is the second largest killer, responsible for 29.1% of deaths (8,500 people) in 2009. Interestingly, 66% of those surveyed did not know that cancers of the digestive system are the most frequent cause of cancer deaths in New Zealand, though they recognised lung cancer is one of the biggest killers. In 2009, traffic accidents and suicides were both responsible for more deaths in New Zealand than skin cancer (melanoma). Yet 48% of our survey participants perceived melanoma as the greater risk. Perhaps this shows how successful the ‘slip, slap, slop’ message has been. Despite respiratory diseases being the third biggest killer of Kiwis, they were largely unrecognised by our survey participants with only 2.1% listing it as what they may die of. It was very sad to see that 10 of the people we surveyed listed suicide as their cause of death, giving suicide a higher representation in our survey population than in real life. Could social media be a good forum for offering support to those struggling with thoughts of harming themselves. Over the next few months we will be delving into the stats more closely, so if there is something you would like us to examine then please get in touch. *Then I would like to be buried in a shroud or biodegradable casket and return my vast store of nutrients back to the land. If space is an issue, then I quite like the idea of being cremated and popped into one of Spanish designer Martin Azua’s Bios Urns which are made from coconut shell, compacted peat and cellulose and contain the seed of a tree. **Head on over to Mike’s Pictures of Numbers blog to see how the infographic came about and for a downloadable version. *** We used Twitter, Facebook, SciBlogs and email to entice over 360 people to fill out our survey using the SurveyMonkey website. The full results are available on Shareshare. Like all online surveys, ours should not be considered representative of the population of New Zealand, but rather of people on social media who were happy to fill out our survey. 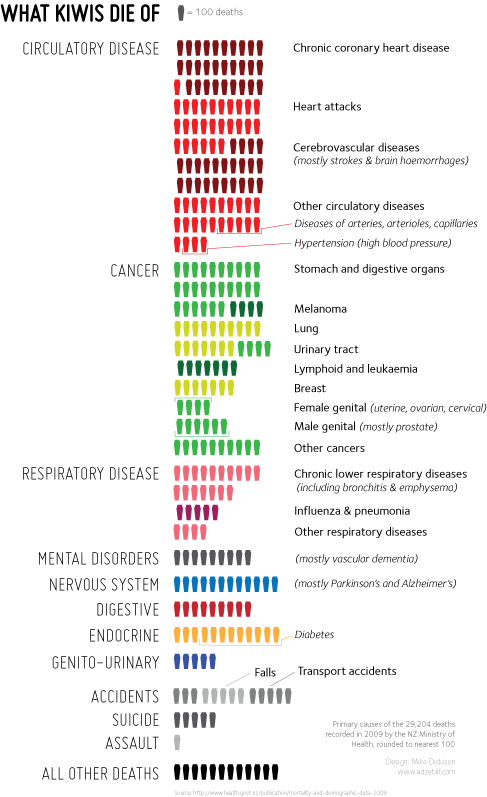 This post was inspired by the Guardian newspaper’s infographic ‘What we die of’ and is a collaboration between myself, chief number cruncher Dr Paul Gardner and data visualisation extraordinaire Dr Mike Dickison. Dr Paul Gardner (@ppgardne) is a Royal Society of NZ Rutherford Discovery Fellow and Senior Lecturer in Bioinformatics at the University of Canterbury’s School of Biological Sciences. He gets very excited about RNA. Dr Mike Dickison (@adzebill) is a freelance information designer with a PhD on the evolution of giant flightless birds. He quite likes ukuleles too. Dr Siouxsie Wiles (@SiouxsieW) is a Health Research Council of NZ Hercus Fellow at the University of Auckland’s Faculty of Medical & Health Sciences. She is rather keen on nasty bacteria and anything that glows in the dark. Does killed by crocodile get classed as an accident or as suicide? > Does killed by crocodile get classed as an accident or as suicide? Digestive is actually a composite category, composed of 1) being eaten AND DIGESTED by something (if you’re not digested it’s counted as Assault), and 2) choking on a digestive biscuit. On body disposal, have you given any thought to Alkaline Hydrolysis? First read about it in a book by Mary Roach (I want to say “Stiff”, but it might have been “Spook”) and it’s becoming my preference over cremation. Although I’m pretty sure it’s not available here yet. I too was surprised by the stomach and digestive organs, though come to think of it, out of the people I know (or have known) with cancer this was more often than not their type. Isn’t it interesting how you hear so much about lung and skin cancer (which is good)… and yet I know nothing about possible ways to prevent myself from getting bowel cancer (or similar). Are these trends similar in other developed countries? Is there anything that other countries are doing to ‘act’ on stomach and digestive cancer? Do we think it is yet another symptom of the change in our diets? Interesting stuff, but you need a way of handling the “old age” response. There’s awfully interesting work that could be done looking at biases in perceptions of causes of death. If people are inordinately fearful of some things that aren’t particularly risky, then that can bias policy around what risks get policy treatment. But if people say “Old Age” when they mean “dying in your 80s or 90s of anything like a heart attack, stroke, cancer”, then I’m not sure that they’re really underestimating the risk of dying of those things. One way forward would be to restrict your cause of death sample to deaths incurred by people under the age of, say, 70, knock “old age” out of your survey sample, and see if things otherwise mesh. I’m not sure it’s a great way forward, but it’s a way. Thanks Eric. We plan on looking at the data for different ages in a future post. Also, “suicide” could mean either current intentions or one’s rational expectation that at age 85, deteriorating physical or mental health might lead you to prefer euthanasia. I didn’t answer the survey. But I hope that my answer could be suicide, where the means of suicide is brain plastination in hopes of the singularity or scanning for upload when the risks of either of those not working out seem less than the risks of low to negative utility continued life, hopefully in my 90s or later. I see that influenza and pneumonia claim around 500 per year, but from an infectious disease viewpoint how many people die of e.g. hospital acquired infections .. MRSA, ESBL, Clostridium difficile .. I would, perhaps incorrectly, think it would be on par with the ‘flu or higher and so wonder where it fits on the graphic, i.e. in the others, or have these untimely demises been scored for the underlying cause or reason for hospitalisation? or is my assumption wrong? Hi Simon, We will look at the infectious diseases deaths in a later post. As I said, I suspect many of them are coded as other things but we will see if we can get to the bottom of it. Hi Siouxsie- that was fun! as you wouldn’t be butchered, I guess the yield of protein would be better, lucky worms! Thanks for joining the discussion 🙂 Agree re misallocation of resources! An interesting survey, I was one of the ones who chose not to “guess” how I might die, it is just too difficult to determine. My father’s side of the family is prone to heart disease but I hope to counter this through better lifestyle choices (and thus far my doctor has not spotted any issues). As an asthmatic I guess my chances of dying of respiratory disease are higher than average but that still does not mean some idiot in a car might take me out first. One of my (very politically incorrect) uni lecturers once said he would prefer to be killed at the age of 95 in bed, by an angry husband. If you had asked the question pre-December last year I wonder how many people would have said that they would die “in the apocalypse” ? Id like to know how many died from medical misadventure. THAT is the one thing I am determined not to followed by the old age one.. who wants to slowly crumble away in a room of misery, knowing someone is getting very rich from the presence. I would gather finding out how deep the mire is on medical misadventure is going to be hard.. Will the old lady of 85 who trips and breaks her leg be an accident, from the fall or the data that her electrolytes were up the shoot cos her GP hadnt kept an eye on her KcL /Digoxin/Nacl levels, from all the meds he had her on.. as cardiac, from her B/p problems from the cardiac irregularities, or as medical misadventure… To the poor treatment received in hospitals that is still swept under the carpet if they can get away with it. I agree it would be difficult to tease out stats for medical misadventure, but imagine the numbers are pretty low. You are much more likely to die from things brought on by your own genetics or lifestyle choices. Very interesting! One thing to consider however. Deaths from dementia are usually very underreported because the immediate cause of death may be pneumonia, but dementia was the overall cause of physical decline and death. @ Darcy Cowan: resomation (alkaline hydrolysis) is being considered by at least two crematoria in large NZ cities, so may be closer than you think. @ Claire: http://www.beatbowelcancer.org.nz/ is trying to change that. @ Siouxsie: thansk for the great post and disucssion – fascinating stuff. The Law Com is corrently reviewing the Burial and Cremation Act and several GPs submitted that they *would* prefer to simply enter “Old Age” as cause of death – or that they actually do write something like “frailty of old age” though of course this is not a direct cause of death. This seems more appropriate to some certifying doctors than simply choosing a condition from the patient’s file and elevating it to cause of death. So, with limited research resource making decisions on death figures (high income countries 71% of deaths are in the over 70s) is somewhat biased. Maybe a survey with DALYs rather than cause of death would be good: The disability-adjusted life year (DALY) is a measure of overall disease burden, expressed as the number of years lost due to ill-health, disability or early death. Thanks Simon. We are intending to do some similar with the DALY stats soon. The one key question not shown is what are the stats for those who die over the age of 70 and those below the age of 70. What is the actual disease that kill us in our old age and what conditions/events are preventing people reaching old age. The other thing always missing is quality of life. Not sure how you measure this but some medical conditions remove life quality a long time before you final past away. Thanks Steven. We plan on looking at the mortality rates for different ages in a later post, as well as quality of life so watch this space! hey, could you make one of these up for india?